This is the most amazing comforter I have ever owned! Ii is so warm we rarely turn on electric blanket on in the winter even tho we do not have a furnace. I have laundered it in the washer and drier numerous times and it comes out beautifully. Sink into the comfort of this luxurious down comforter. 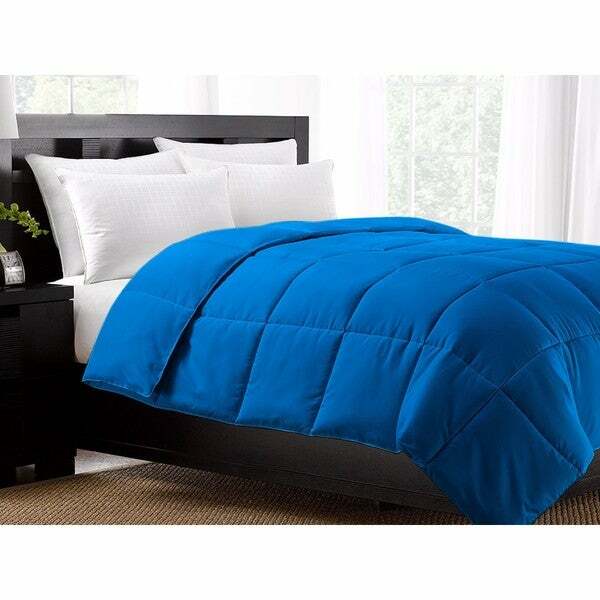 Polyester fiber fills the 100-percent brushed microfiber polyester shell, which comes in an array of solid colors. Box quilting keeps the fill from moving or bunching, and the 220 thread count ensures a soft feel. This comforter is the perfect choice for any season and can be machine washed for convenient cleaning. Dimensions Twin: 62"x86"; Full/Queen: 86"x86"; King: 102"x86"
Nice and warm and beautiful colors to choose from!